THE STATUS OF LANGUAGES – DOES OFFICIAL RECOGNITION MATTER? Linguapax opens the debate on how legal frameworks contribute to the preservation and promotion of local languages, and which are the resulting language policies in the light of the analysis of plural yet comparable experiences. How can consensus in determining the status of languages be forged? What is the meaning of the official or other legal status of languages provided for in constitutions or legislation? What is the real impact of the legal framework on languages in shaping linguistic life? What distance is there, if any, between the legal framework and the practices of political and social actors involved in the protection of languages? In order to obtain accurate information and to be able to discuss the implications of the different political and legal models, we shall bring together legal experts, sociolinguists and activists from or familiar with Finland, India, Malta, Paraguay, Slovenia, South Africa and Switzerland. of Japan. Some 150 students participated in the workshops with the purpose of raising awareness of the multilingualism, and indigenous and minority languages in Japan. 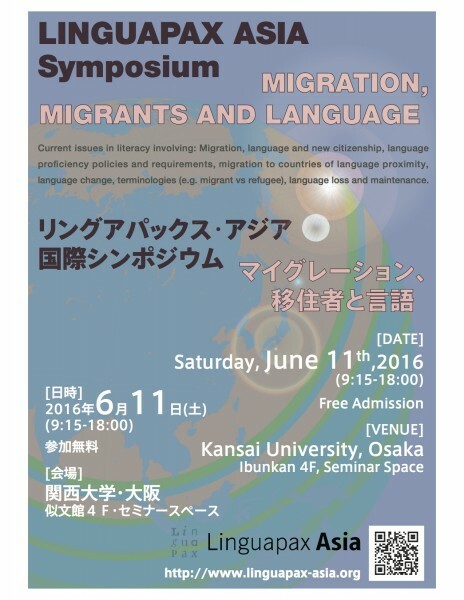 Posters of students’ presentations will be displayed at the upcoming Linguapax Asia 2016 symposium at Kansai University in Osaka, and the best group invited to give a presentation of their research at the symposium. Linguapax Asia will participate at the JALT2015 41st Annual International Conference on Language Teaching and Learning from November 20 to 23 in Shizuoka. Please visit our display table in the Educational Materials Exhibition Hall and attend a presentation “Preserve Culture, Language & Develop Our Minds” on Sunday November 22, from 4:05 – 4:30 pm in Room 907.